Welcome to Summer Run Farm! 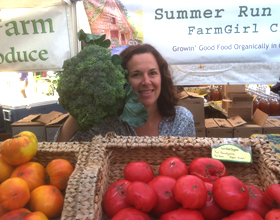 Summer Run Farm is a certified naturally grown farm in Carnation, Washington. We sell at local Farmers Markets to supply your family with fresh produce all season long. Cathryn grows intensely beautiful, flavorful produce on approximately five acres of her 20-acre property (having outgrown a two-acre farm several years back). Her farm is on the valley floor — yes, that means floodplain. A former school teacher, Cathryn got into farming in 2001 and is a hell of a good one, having a green thumb, tractor know-how, and market savvy — a nice combination in this (bumpy) field. Cathryn grew up about five miles, as the crow flies, from where she farms now... THAT'S a LOCAL FARMGIRL! Cathryn has been selected to serve on the King Conservation Advisory Board, using her years of experience to guide rural agricultural policies and protect local farming.